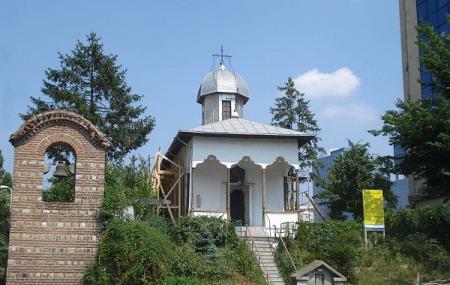 Legend has it that this Eastern Orthodox chapel was built by the very man from whom the city of Bucharest gets its name. There is no strong consensus on when it was built, though to church first shows up on maps in the mid 19th century. Other records suggest that the first church on this spot was wooden, replaced by a larger structure in 1416. The church is small and white but kind of pretty and elegant. It has a cupola with a mushroom-shaped roof. You have to climb 33 steps from the street to reach up to the church and these symbolize the age of Christ when he was crucified. The hours of the church given here are approximated based on general church timings in the city. Actually timing may be different. Call the attraction to confirm before your visit. By Trams: 23 and 27 stop Pasaj Marasesti. By Metro: M1, M2, M3 line stop Piata Unirii. By Bus: 104, 116, 117, 123, 124, 312, 313, 783, N102, N104, N105, N106, N107, N108, N109, N110, N111, N112, N114, N115, N116, N117, N119, N121 stop Piata Unirii. By Trams: 7, 27, 32, 47 stop Piata Unirii. How popular is Biserica Bucur? People normally club together Jewish Museum and Constitution Square while planning their visit to Biserica Bucur. The oldest church in Bucharest, might be the smallest too for all I know, a peaceful jewelry in the middle of the city. And since you're there, you can also visit the monastery just across the street, also beatiful. Very cool to see the oldest building in Bucharest. An awesome place, you have to visit!